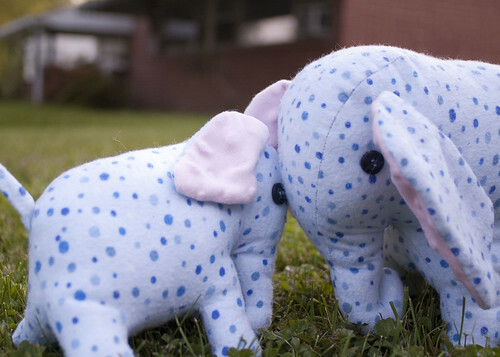 I've been drooling over the super cute stuffed elephant in Sew Everything Workshop for years now. Recently, after hemming up some pants and shirts for my mom, I realized I wasn't making fun stuff for myself on the sewing machine because I felt I wasn't thin enough to wear cute clothing. I know this is stupid, stupid, stupid, but it was really killing my enjoyment of sewing. I decided to take a step back and make some of the patterns I have for children. 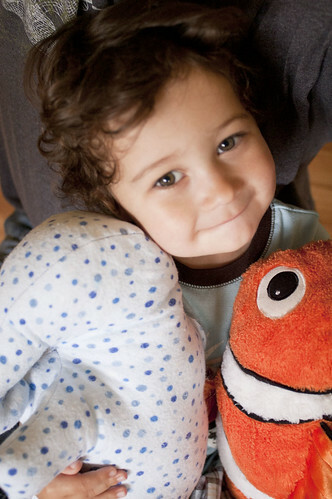 After all, it's hard to feel bloated just because your son is holding two stuffed animals. I originally told him I'd make him an elephant, and that we had to go to the store for fabric. He had no understanding of what I was going on about. He asked me where the toy elephant was in the Jo-Ann store. He asked me what the word make meant. He begged me for the elephant on the way home from the store. I felt pretty badly about the whole incident and did not delay on starting the Mommy elephant pattern, which I cut out that night. The next day, I started sewing pre-nap and I showed him the elephant's trunk (which he again did not understand), but got the majority of the body done while he was asleep. I quickly stuffed it, but I had lost my hand sewing needles so I was unable to seam up the open holes in the body and ears, and I was unable to attach the ears and eyes. No matter. When my son woke up, he was astonished to find an elephant like creature waiting for him. I showed it to him and he asked his daddy softly, "Can I hold it?" I said, "Of course." I also explained how I needed to add eyes and ears. 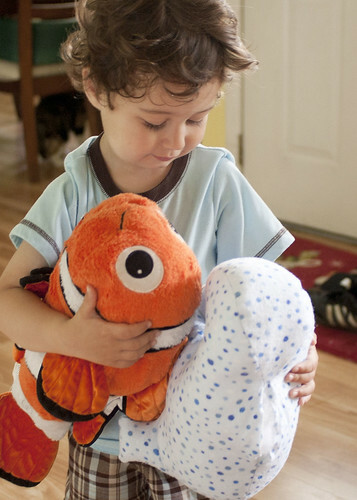 He hugged it gently and said, "I love it." And he proceeded to hold it for another hour in the car and to lovingly ask me when I'd put the eyes on. He also asked me where the baby elephant and daddy elephant were located. I explained I had to make them. With some quick needle work (and some hand sewing needles from Safeway), I was finished with the mommy elephant in time for his next nap. 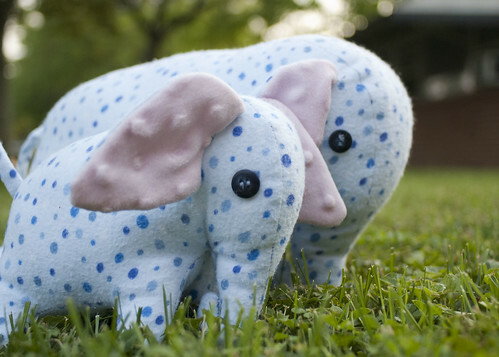 I used a flannel from Jo-Ann for the body of the elephants, some Minky like material for the ears (which I have a ton more of should I ever decide to become a stuffed animal producing machine), and cheap-o buttons for the eyes. I can't recommend this pattern enough. 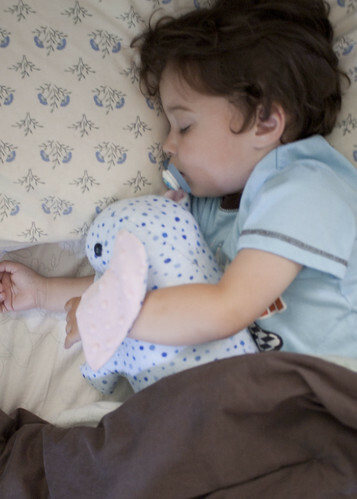 Anyone seen any other cute stuffed animal patterns out there? Maybe it's time to knit up a stuffed animal! CUTE!! I've made a bunch of knit toys from Susan B. Anderson, mostly from her book Itty Bitty Toys. They're easy to make, and come out so adorably! I've made an elephant (not in this book, but still a SBA design), the lamb, and the hippo. One of the women in my knitting club made the ducks, the snake, and several of the reversible toys, and they're all so adorable! And if you don't follow her blog, you should, since she has lots of free patterns available too! I love the subtle pattern on the ears - nice to rib and you are falling asleep or are anxious. Velvet would also be nice (Molly's ears were silky velvet and were her best feature). Ring, Ring, Ring, God Calling! Testing, Ding, Ding, Is This Thing On? !